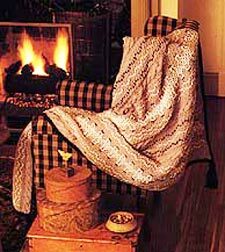 Design on design creates this richly textured afghan. First, you knit cable stitch panels and then using two strands of yarn, weave yarn through the nubs to overlay a design. Pattern 1: 4 stitches = 1", 11 rows = 2", Pattern 2: 4 stitches = 1 1/4" = 2"
Worked on a multiple of 4 stitches. Rows 1 and 3: Wrong side, P.
Row 2: *K2, P2 together, leave original stitches on left-hand needle, p the first stitch of the 2 taken together, slip the 2 original stitches from needle (called a purl twist 2); repeat from * across. Row 4: * Purl twist 2, k 2; repeat from * across. Repeat these 4 rows for Pattern 1. Cable worked over 8 stitches. Rows 1, 3, 5, 7, 9: Wrong side. K1, p6, k1. Row 2: P1, slip next 3 stitches to dpn, hold in front of work, k3, k3 from dpn, p1. Rows 4, 6, 8, 10: P1, k6, p1. Repeat these 10 rows for Pattern 2. Outside Panel 1: With MC, cast on 67 stitches. Row 1: Wrong side. K2; work Row 1 of Pattern 2 over 8 stitches; k2; work Row 1 of Pattern 1 over 44 stitches; k2, work Row 1 of Pattern over 8 stitches; k1. Row 2: K1; work Row 2 of Pattern 2 over 8 stitches; k2; work Row 2 of Pattern 1 over 44 stitches; k2; work Row 2 of Pattern 2 over 8 stitches; k2. Keeping to patterns as established, work stitches between patterns and at each edge in Garter Stitch (k every row). Work until approximately 68 inches from beginning, ending with Row 2 of Pattern 2. Bind off on wrong side. With MC cast on 67 stitches. Row 1: Wrong side. K1; work Row 1 of Pattern 2 over 8 stitches; k2; work Row 1 of Pattern 1 over 44 stitches; k2; work Row 1 of Pattern 2 over 8 stitches; k2. Row 2: K2; work Row 2 of Pattern 2 over 8 stitches; k2; work Row 2 of pattern 1 over 44 stitches; k2; work Row 2 of Pattern 2 over 8 stitches; k1. Keeping to patterns as established, work stitches between patterns and at each edge in Garter Stitch. Complete as for Outside Panel 1. Note: k1 garter st is placed at each outside edge. With MC cast on 110 stitches. Row 1: Wrong side. K1; work Row 1 of Pattern 1 over 20 stitches; k2; work Row 1 of Pattern 2 over 8 stitches; k2; work Row 1 of Pattern 1 over 44 stitches; k2; work Row 1 of Pattern 2 over 8 stitches; k2; work Row 1 of pattern 1 over 20 stitches; k1. Row 2: K1; work Row 2 of Pattern 1 over 20 stitches; k2; work Row 2 of Pattern 2 over 8 stitches; k2; work Row 2 of pattern 1 over 44 stitches; k2; work Row 2 of Pattern 2 over 8 stitches; k2; work Row 2 of Pattern 1 over 20 stitches; k1. Keeping to patterns as established, working stitches between patterns and at each edge in Garter Stitch, work to same length as side panels. Use a double strand of yarn when working weaving pattern. Weave through nubs formed by the purl twist 2 of Pattern 1. Work Chart 1 over each 44 stitch section and Chart 2 over each 20 stitch section. With MC weave Center Panel to Side Panels. Join B to one corner of Afghan. Round 1: Chain 1, with crochet hook work 2 sc in corner; being sure to keep work flat and that corresponding sides have same number of stitches, (sc along one edge to next corner, work 3 sc in corner) 3 times, sc along last edge to starting corner, 1 sc in starting corner, join with a sl st to first sc. ch 1, DO NOT TURN. Round 2: 2 sc in corner, sc in stitches around, working 3 sc in each corner, ending with 1 sc in starting corner. Join with a sl st. Ch 1, DO NOT TURN. Round 3: With right side facing, working backwards from left to right, sc in each stitch. Join with a sl st. Fasten off. Make 4. For each tassel cut 40 strands color B, 12" long. Cut another strand of B about 12" long. Place the extra strand at center of the 40 strands and fold them in half over the extra strand. Knot this strand tightly over all strands. With another length of yarn, wind several times around all strands about 1" below fold, to form a head. Tie tightly. Sew a tassel to each corner as shown. Trim tassels.